But the price tag seems to be out of touch with reality. Anything tested to work well with PET/VIC/C64 keyboards that doesn't cost both arm and leg? I just use a circuit writer pen on my c64 keyboard contacts and it works great. I have always just used isopropyl alcohol on Q-tips and gently rubbed the surfaces of the conductive rubber pads, and always had excellent results. I don't think that the conductive rubber loses its conductivity, but rather that the contacting surface of the rubber picks up dirt and pollutants and forms a non-conductive film that the alcohol (and very mild abrasion of the cotton Q-tip) removes. >But the price tag seems to be out of touch with reality. Anything tested to work well with PET/VIC/C64 keyboards that doesn't cost both arm and leg? > But the price tag seems to be out of touch with reality. Anything tested to work well with PET/VIC/C64 keyboards that doesn't cost both arm and leg? There are people who suggest a pencil, grade 9B, meaning the softest one. You could also try 'Graphit 33' from Kontakt Chemie. But first, I'd try to clean the contacts and see if that helps. refreshing on a few keys. >> work well with PET/VIC/C64 keyboards that doesn't cost both arm and leg? > There are people who suggest a pencil, grade 9B, meaning the softest one. > You could also try 'Graphit 33' from Kontakt Chemie. > But first, I'd try to clean the contacts and see if that helps. domes. He got 100% success out of it. Some people collect things for a hobby. Geeks collect hobbies. I like to use the Graphit 33. It has fixed my whole Plus4 keyboard. pad slightly offset and I have used the Graphite to enlarge those pads. You can spray the paint to a cap and use a brush to paint the pads with it. > refreshing on a few keys. de-glaze/roughen, the contacts before you apply it. > de-glaze/roughen, the contacts before you apply it. > But the price tag seems to be out of touch with reality. > Anything tested to work well with PET/VIC/C64 keyboards that doesn't cost both arm and leg? I've found that in the first instance a good clean of both contacts and gold-plated board pads with isopropyl usually works. Failing that a very light sanding with fine sandpaper of an emery board, just to remove the "glazing" of the rubber, followed with a clan with isopropyl has always worked for me. Thanks for all the responses. I have now a few things to try, starting probably with warm ultrasonic bath for the keys and cleaning the PCB pads. I take those conductive key elements are nowhere to source these days, are they? > Thanks for all the responses. I have now a few things to try, starting probably with warm ultrasonic bath for the keys and cleaning the PCB pads. I take those conductive key elements are nowhere to source these days, are they? >> Thanks for all the responses. I have now a few things to try, starting probably with warm ultrasonic bath for the keys and cleaning the PCB pads. I take those conductive key elements are nowhere to source these days, are they? No, I know those are available but those are different than what's inside the proper keyboards (as opposed to rubber keypads). Rather than round pads, there are "strips" spanning across the lower end of the plastic "rod" that's pushed down on keystrokes. I'd be interested in buying either the conductive "strips" or the whole element (rod with strip). They might possibly be still used in some modern keyboards. >>> Thanks for all the responses. I have now a few things to try, starting probably with warm ultrasonic bath for the keys and cleaning the PCB pads. I take those conductive key elements are nowhere to source these days, are they? > No, I know those are available but those are different than what's inside the proper keyboards (as opposed to rubber keypads). Rather than round pads, there are "strips" spanning across the lower end of the plastic "rod" that's pushed down on keystrokes. I'd be interested in buying either the conductive "strips" or the whole element (rod with strip). They might possibly be still used in some modern keyboards. But yeah, the other contacts can be a bit more difficult to find. Unless you get big round pads and cut them to size, or something. condition is "tested working" but naturally not like new. 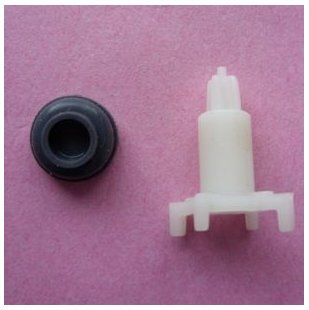 Would this be something that could build up the contact flush again to make a better contact. I remember something about this years ago and would need to find a link to see if this product is still available. Try the key contact usually those wear out too. I surmise you're referring to the keyboard PCB contacts?